I think I'm feeling bad about leaving for Milwaukee on Thursday. Cause I noticed today I was going above and beyond for both Captain Jack and C. The house is super clean, the laundry is all done, the frig is fully stocked, ready made meals are prepared, and Arlin's stuff is in order for basically a baby sitter. I might just have some anxiety over this trip. It will be my first time way from Arlin for more than 24 hours. Yikes! O.k. anyways, my experiment... I cooked Risotto for the first time last night. I've never tried it cause I'm not a big fan of rice and such but Risotto is an all time favorite of Chad's so I thought I'd challenge myself and get creative with it. First, I sauteed some chopped onions and garlic with olive oil and butter for a few minutes then I added the Risotto rice, adding organic chicken broth cup by cup until absorbed. My twist to the recipe was substituting one of the cups of Chicken broth with pureed steamed cauliflower, Parmesan cheese, garlic, purified water, and pinot griggio. I actually made Risotto! And I didn't exceed "al dente'! "- Chad's request. 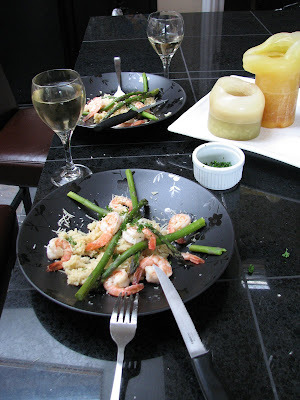 A top the creamy Risotto... steamed Asparagus,white wine, garlic sauteed shrimp, garnished with minced parsley and fresh grated Parmesan cheese. YUM. I really like cooking. Especially when I pull something off, but then who doesn't enjoy a success story in the kitchen? I seem to be surfing recipes on-line lately, for something new. Orthopedic doctor Thomas Doty called yesterday while I was out with Arlin. Looks like I have to go back in and have the big dog surgeon Dr. Kosta evaluate the MRI scan with me. For now- Dr. Doty's diagnosis; a Baker's cyst from direct impact under the center portion of my left knee cap, excess fluid retention and a slight meniscus tear that possibly needs to be scoped. In which they will shave the slight tear off. Boo Hoo. I've gotten better news. Then again I suppose I should be grateful my ACL and MCL are intact. yummy! good job chef. it sounds like your knee isn’t as bad as it could be which is good! i am leaving palmer all day on friday, which isn’t as long as you, but it will be my first time away from palmer for more than a couple hours. by the way he will not nap. i don’t know what it is, i want a nap today!